Creve Coeur Park offers boat and bike rentals, a phone/brochure tour, and a treetop adventure course. There are also playgrounds, hiking trails, tennis courts, and fishing areas. Maryland Heights, St. Louis (April 27, 2018)— The Convention and Visitors Bureau of Maryland Heights, MO and Visitmarylandheights.org are announcing the best spring and summer activities for Creve Coeur Lake. Currently, Creve Coeur Lake Memorial park features playgrounds, spray fountain play areas, hiking trails, and water trails. There are also disc golf courses, archery ranges, tennis courts, and fishing areas. Creve Coeur Lake is the largest in St. Louis County, taking up most of the 2,145 acres of its park. It is a historic site with ties to the foundation of St. Louis. Early settlers in the region built hotels, bridges, and railroads to the lake, which would eventually become a park. The addition of Sailboat Cove in the 1980s added to the lake’s natural splendor with modern amenities. – Great Rivers Greenway, a public agency that promotes the preservation of rivers and parks in the St. Louis area, has partnered with the St. Louis County Department of Parks to provide 6 miles of scenic water trails across the lake and its environs. The expedition is a two-fold adventure: one part is for observing the natural flora and fauna that inhabit the areas around the lake; the other is a real-life documentary about the history of the park. Participants can use their smartphones or a brochure to get additional information as they go along. Some parts of the tour will coincide with the hiking trails that circle the lake. The water trails went live in 2015, so visitors who haven’t been to the lake in the last 3 years may have missed the opportunity. – The Go Ape! Treetop Adventure returns to Creve Coeur for the 2018 season. Participants can take part in an above-ground adventure that includes zip lines, “Tarzan” swings, and rail tracks, all from the treetops. Bookings are available for weekends and Mondays in April and May. June and July expeditions can be booked daily, which continues until August 14th, at which point availability returns to the weekend schedule. More information can be found at their official site. 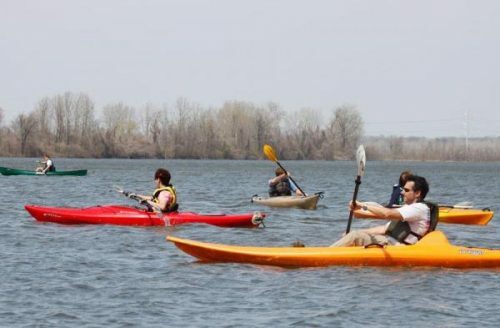 – Creve Coeur Lake Boat & Bike rentals opens in March and remains open until October, making spring and summer the time to take advantage of their vehicle rentals. Amphibious visitors can try out kayaks, canoes, and paddleboards, while land lovers can rent quadricycles and bicycles to enjoy the lake’s many trails. For more information, go to https://www.visitmarylandheights.org/.